I got in late last night from a week in France with Eric; it was the anniversary of our being together for 25 years, and we took some time to be together hiking and visiting the countryside. Thinking about being together for 25 years (I hardly know how I’m old enough to have been with a partner for 25 years! ), we reflected again on the story of our life together, and how to have a meaningful life—how to live in time, in change, in uncertainty, and also how to prioritize what matters. I felt very grateful that I’ve been able to prioritize my relationships, my writing and my social/spiritual engagement—that often comes through writing–in my life. And I’ve seen how things are at the same time always changing and also largely staying the same–Paris, for example, is both different and very similar to the way it was when we lived there in 1996! I created Align Your Story to help others prioritize their creativity, voice and engagement and to help others live with more ease in their own stories. I’ll be starting the weekly module-by-module conference calls again this fall on September 22nd. If you sign up by Labor Day (September 4th) you can sign up with an early bird special (a reduction of $100) and if friends sign up together you both get an additional 15 percent discount. Sometimes, an online course can seem off-putting. But there are also great benefits that can come with an online course that you can’t get in an in person course. And I want to outline just a few of them today. You can get more content at your own convenience, in a more integrative way. I find I’m able to give much more content in an online course than in an in person course. You don’t need to take in all the course material at once so I can give you more. 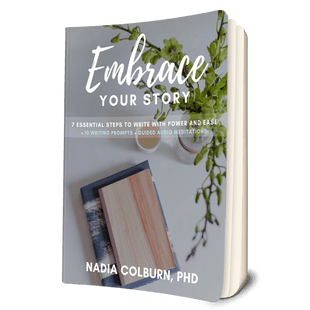 And because most of the material of Align Your Story is not only in text format, but also in audio format, you can listen to the material of the course when you take a walk, or are doing the dishes. This is not only more convenient for busy lives, but also a better way to integrate your learning. We know that sitting still, as people do in traditional classrooms, is not the best way to take in new material, and being able to learn when you are ready to learn can make the learning process more integrated and deeper. You can self pace yourself and come through the material again and again. With Align Your Story, you can go into more depth with the material that is more suited to you and come back to other material later. Listen to something two times or three times. Choose to focus on one part of the course or another. Traditional courses ask all people to do the same kind of work with the same timeline. With a self-paced course, you can tailor your particular learning to your particular interests and needs—and come back again and again for deeper, and different experiences. You have an ongoing community, not a community that ends with the end of the course. When you sign up for a traditional course, you are part of a strong community for the hours you are in the course, and once the course ends that community almost always disbands. In Align Your Story, once you enroll you have lifetime access to a strong community of like minded writers. You can communicate with them whenever you want, and you can stay in an ever-growing authentic community of heart-centered writers around the world (we have students in Germany, England, South Korea, Washington State, Illinois, throughout the Northeast, Texas and more). If you want in person meet-ups, there are also in person meet ups in the Boston area and, I hope in the future, in other areas as well! The community focus in traditional courses is so strong, that it’s harder to really listen to yourself and not to worry about performance, and what the teacher and other students might think. In Align Your Story, because the course is online, you have much more freedom to pay attention to what you want to say, to take risks, to experiment, and to come to trust your own voice and body. It’s hard to imagine an in person class that would give you all the tools to create ongoing writing, yoga and meditation practices and to integrate the three. Would it be held in a yoga studio or in a room with desks? Because the course is online it can support all three practices equally with text, audio and video formats and the support of a facebook group and live conference calls to ask questions and get support. Align Your Story is very user friendly, and because so much of it is audio, you can do most of the work away from your screen, connecting to your body or writing in a good old fashioned notebook. So I encourage you to think again if you believe an online course isn’t for you. Yes, we are living in a changing world–and some of that change is hard, but there can also be benefits to be gotten from the changes. If an online course isn’t for you, and if you’re local, I also have a number of in person courses and workshops that I’m also offering this fall—see below. I’d love to see you at any of them! And there are still a few spaces left in my retreat this weekend; if you’d like to treat yourself to a grounding, rejuvenating weekend of writing, yoga and meditation, I’d be delighted to see you! As always, please pass this on to any friends who might be interested, and reach out with questions or just to say hi. I love to hear from you.